Only a dozen of these cosmic oddballs are currently known. 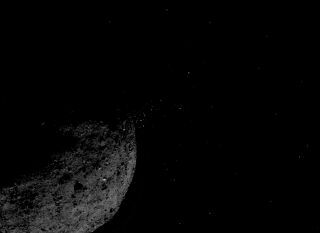 This view of the asteroid Bennu ejecting particles from its surface on Jan. 19, 2019, was created by combining two images taken by NASA's OSIRIS-REx spacecraft: a short-exposure photo, which shows the asteroid clearly, and a long-exposure version, which shows the particles clearly. Other image-processing techniques were also applied, such as cropping and adjusting the brightness and contrast of each layer. The near-Earth asteroid Bennu is a lot weirder and more interesting than scientists had thought. The 1,650-foot-wide (500 meters) space rock ejected particles of dust and gravel into space multiple times over the past few months, newly announced observations from NASA's OSIRIS-REx spacecraft reveal. So, Bennu is one of just a dozen or so known "active asteroids" — and the only one to be observed up close. The discovery "is probably the biggest surprise of the early stages of the OSIRIS-REx mission and, I would say, one of the biggest surprises of my scientific career," OSIRIS-REx principal investigator Dante Lauretta, of the University of Arizona, said during a news conference today (March 19). The $800 million OSIRIS-REx mission launched in September 2016 and arrived in orbit around Bennu on Dec. 31 of last year. If all goes according to plan, in mid-2020, the probe will dip down and grab a sample of Bennu material, which will come down to Earth in a return capsule in September 2023. Analysis of this pristine cosmic dirt and gravel will help scientists better understand the solar system's early days. It could also help reveal the role that dark, carbon-rich asteroids like Bennu may have played in delivering water and the chemical building blocks of life to our planet, mission team members have said. OSIRIS-REx's observations will additionally shed light on how potentially dangerous asteroids move through space and which of the space rocks miners may want to target down the road, among other things. Indeed, there are numerous subsidiary goals, as indicated by the mission's full name: "Origins, Spectral Interpretation, Resource Identification, Security-Regolith Explorer." But the team didn't expect to get an up-close look at an active asteroid. So, it came as a big surprise when OSIRIS-REx photos showed particles streaming from Bennu's rugged surface on Jan. 6, just a week after the probe's arrival in orbit around the space rock. And that was hardly an isolated incident: Mission team members have now identified 11 such events, three of which were "substantial" ones involving dozens to more than 100 particles, Lauretta said. And researchers are still going through the imagery. The ejection events involve bits of space rock ranging from a few centimeters to up to tens of centimeters in diameter, Lauretta said. And the particles' velocities vary widely, too. Some move at up to 7 mph (11 km/h), fast enough to escape Bennu's weak gravity and cruise into interplanetary space. And other pieces merely mosey out, becoming trapped in orbit around Bennu for a spell and then falling back down onto the asteroid's surface. "Basically, it looks like Bennu has a continuous population of particles raining down on it from discrete ejection events across its surface," Lauretta said. "This is incredibly exciting." The team doesn't know what's spurring the ejection events. The ejections have been observed around the time of Bennu's closest passage to the sun during the asteroid's elliptical orbit, which occurred this year on Jan. 10. So, solar heating of the asteroid's surface and near-subsurface may be the main driver. But that's just speculation at the moment, Lauretta stressed. But let's get back to those particles that manage to break free of Bennu's tenuous grip. It's possible that these little asteroid pieces cause a meteor shower here on Earth every year, Lauretta said. The putative "Bennid" shower would appear in September and be best-observed from the Southern Hemisphere. The mission team is working with meteor experts from the SETI (Search for Extraterrestrial Intelligence) Institute to hunt for the Bennids, Lauretta said. After a series of analyses, the OSIRIS-REx team has concluded that the ejected particles don't pose a serious risk to the spacecraft or its mission objectives. But other complications have arisen, suggesting that the 2020 sampling sortie will be more difficult than previously imagined. OSIRIS-REx scientists announced today in a series of papers that Bennu is far more rugged and boulder-strewn than ground-based radar imagery and modeling work had indicated. The original mission design called for OSIRIS-REx to sample material from a relatively smooth, flat patch of Bennu's surface at least 165 feet (50 m) wide. But there don't appear to be any such oases on the asteroid; the biggest flat patch appears to be in the 65-foot (20 m) size range, mission team members announced today. OSIRIS-REx will likely require an update to its navigation software to pull off a sampling run in a tighter space, Lauretta told Space.com. And the team will probably need to take more high-resolution photos of the sampling site than had been anticipated. But Lauretta and his fellow team members think OSIRIS-REx will meet the challenge. "Our navigation performance has been exquisite," OSIRIS-REx project manager Rich Burns, of NASA's Goddard Space Flight Center in Greenbelt, Maryland, said during today's news conference. "We feel confident that our systems and our teams are up to the task." The Greatest Asteroid Encounters of All Time! Mike Wall's book about the search for alien life, "Out There" (Grand Central Publishing, 2018; illustrated by Karl Tate), is out now. Follow him on Twitter @michaeldwall. Follow us on Twitter @Spacedotcom or Facebook.